Article courtsey of Northumberland cottages / Northumbria Byways. This is a walk of approx 13 miles with some strenuous walking in parts. A wonderful circular walk takes you up to the Border Fence at the one place where you can stand in England and look for miles south into Scotland. The route then follows the Pennine Way to a mountain rescue hut and from there up onto the Cheviot itself. Start: The gate before Mounthooly at GR882227. Stage 1 - Gentle climb up the hillside following a broad path until you reach the summit of the Schil. At 1985 feet in height it is just 15 feet short of qualifying as a mountain! Stage 2 - Follow the border fence south and west down hill and further up the valley from where you started. On your right you have long views into Scotland. 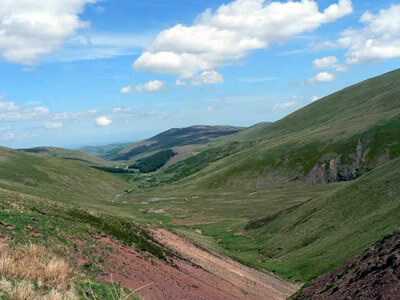 On your left you have the bulk of the Cheviot and slowly the Hen Hole itself will come into view. Stage 3 - After a short distance you will come to Red Cribs and the Mountain rescue hut. Stop at Red Cribs and admire the view down the length of the College Valley. To your right you can now see directly into the Hen Hole which is a massive corrie and gorge cut deep into the Cheviot. 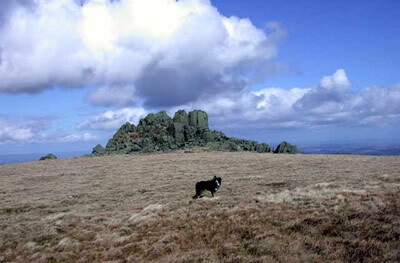 Stage 4 - Steep continuous climb onto Auchope Cairn and then onto the Cheviot itself. Stage 5 - Slight descent to Braydon Crags where you can explore for the remains of the crashed flying fortress amongst the peat hags. Stage 6 - Continuous descent past Dunsdale House to the Lambden Valley and then follow the road down to Southernknowe. Cross the river at Sutherland bridge and then head up the valley returning to Mounthooly. 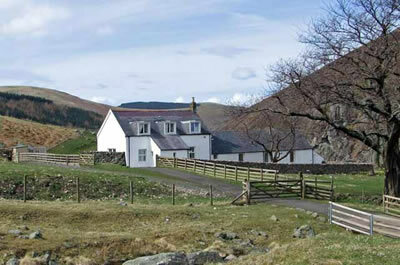 Dunsdale House is a great place to stay for a hillwalking holiday and can be rented via Northumberland cottages agency Northumbria Byways.